Moments to Remember is a 144-page resource tool that guides families as they think and reminisce about their lives. According to the publisher, the topics open up dialogue between generations so that family members have a structured opportunity to learn more about each other. Questions serve as focal points for intergenerational discussions. Almost everyone over 50 occasionally complains about memory glitches—time-consuming searches for misplaced glasses and keys, difficulty recalling names only minutes after an introduction and, perhaps most frustrating of all, coming up empty when a familiar word is on the tip of the tongue. While people tend to joke about these "senior moments," the humor camouflages an underlying fear of Alzheimer’s disease. Their concern isn’t unfounded: about five percent of people age 65 and older (and a much larger proportion over 80) develop Alzheimer’s. However, there is mounting evidence that memory lapses don’t necessarily foreshadow dementia. What often leads to these lapses are "brain busters," such as fatigue, depression, poor physical health and medication. Stress is another factor getting closer scrutiny. Researchers at Yale Medical School, for instance, recently reported in the journal Science that stress activates a brain protein called kinase C, or PKC, that can undermine short-term memory. Other researchers have found that sustained high levels of the stress hormone cortisol can damage the hippocampus, a part of the brain that’s central to memory. Scientists increasingly believe that it’s possible to fight brain busters by taking control of your life and reducing stress. What works is a strategy to improve overall health—and to stimulate the brain with exercises that have been called "aerobics for the mind." Exercise regularly. Aerobic activity—walking, dancing, biking, for at least 20 minutes three times a week—increases blood flow and the delivery of oxygen, sugar (as glucose) and nutrients to the brain. 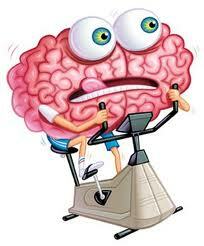 Recent scientific studies have shown that aerobic fitness may reduce the loss of brain tissue common in aging. Stick to a healthy diet. Avoid sugar and saturated fat. And eat lots of antioxidant-rich fruits and vegetables such as blueberries, spinach and beets. Magnesium found in dark green, leafy vegetables appears to help maintain memory. Learn something new. Activities you’ve never done before, such as playing the piano or learning a foreign language, stimulates neuron activity. People exposed to positive reinforcement before completing memory exercises scored well above others exposed to negative reinforcement in a recent North CarolinaStateUniversity study. Get enough sleep. Too little sleep impairs concentration. Anecdotal evidence shows a good night’s sleep appears to boost memory after learning something new. Devise memory strategies. Make notes or underline key passages to help you remember what you’ve read. Invent mnemonics—formulas to help you remember things. Socialize. Conversation, especially positive, meaningful interaction, helps maintain brain function. Get organized. Designate a place for important items such as keys and checkbooks. Keep checklists for things like daily medications or items to pack when you travel. Turn off the tube. Some experts say too much TV watching weakens brain power. Jot down new information. Writing helps transfer items from short- to long-term memory. Solve brainteasers. Crossword puzzles, card games and board games improve memory.